My sister, Robin Oxman, her husband Daniel Perez, and their two children, Carlos, 8, and Alejandro, 4, live in Barcelona, Spain. Two years ago, on September 30, 2009, Alejandro went to the doctor because he had been having stomach pain that was keeping him up at night, although come daytime he would seem fine. Various trips to the emergency room and pediatrician were not able to diagnose or solve this problem. He always seemed so full of life and energy that the general consensus was that this was some small stomach virus. Finally, on the 30th, after a few days of low-grade fever and horrible stomach pain the previous night, upon arrival at the pediatrician’s office they realized something was definitly not right. Alejandro didn’t want to leave the stroller- not like him at all. He complained that his hands and legs hurt. He was pale. Only four days earlier he had been running like a madman through the park as if nothing were wrong. The pediatrician felt his tummy and sent him immediately for an X-ray. The X-ray was discussed at length among the pediatricians- at which point my sister knew something was very wrong. They were sent directly to the emergency room, X-ray in hand. The pediatrician even called ahead to alert the hospital that they would be coming. At that point we only knew there was something “not right” but not what it was. That afternoon of September 30th, their lives would be changed forever. Preliminary ultrasound showed a 9.5 x 5.5 cm. tumor in Alejandro’s abdomen and blood counts that were way off. When the doctor came in to explain the test results, my sister was alone. My brother-in-law had gone to drop their other son at a friend’s house to be able to accompany my sister in the emergency room. First, the doctor told my sister about the blood counts and that Alejandro would immediately receive blood and platelet transfusions and would be put on IV antibiotics as a precautionary measure. 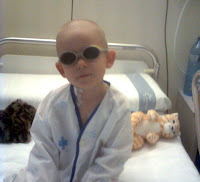 Then, the doctor told my sister that her son had cancer. The word no parent ever wants to hear. As my sister says, the word that “doesn’t even fit in her head”. The doctor told her they probably even knew the exact diagnosis, but wanted more testing done before confirming. She was also informed that they would be admitted to the oncology ward on the spot. Soon after, my brother-in-law arrived and my sister then had to pronounce those unpronounceable words to her husband. There was no looking back. Carlos was moved into a friend’s house for the following week so that my sister and her husband could be with Alejandro around the clock. The next days flew by with biopsies, MRI, MIBG scans and surgery for central port placement. 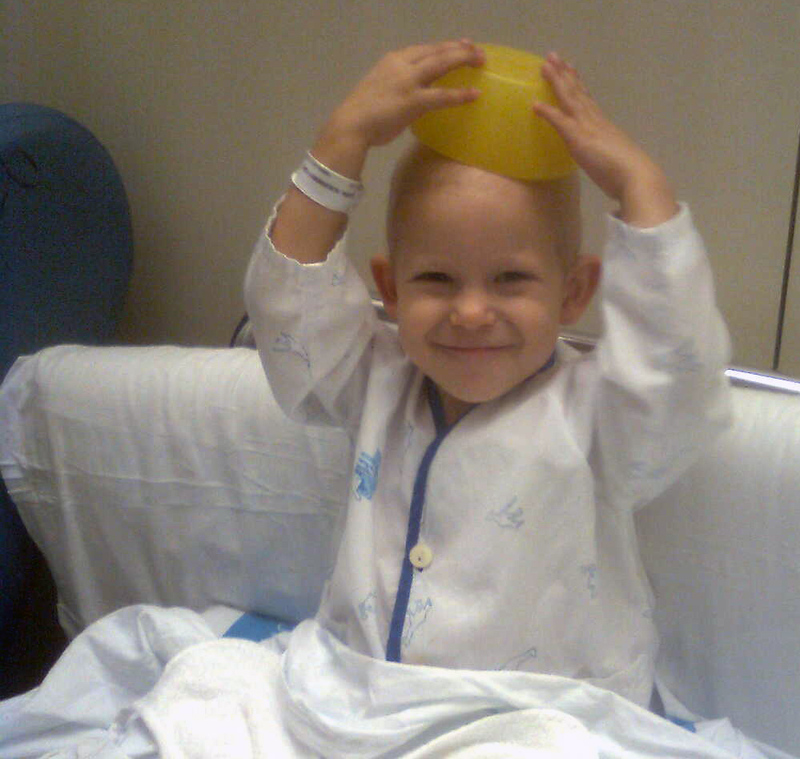 Then they had to sit with the oncologist and hear that their son, not yet two and a half years old, had stage IV Neuroblastoma with metastasis to skull, femurs, arm bones, bone marrow and some vertebrae as well as the large primary tumor that was wrapped around the left adrenal gland and kidney and part of the aorta. They were also told that some cases of Neuroblastoma can be cured, but that the relapse rate is very high since Neuroblastoma can “hide” and reappear time and time again due to what is known as minimal residual disease or MRD. The treatment protocol was explained. Forms and consents were signed and, after all of this, as my sister and her husband were heading to the door, the oncologist told them one more thing, perhaps the most important thing he had told them during that meeting: “You’ve just listened to some very heavy information. It will take time for it all to sink in. You will each process this in your own way. Never let your son see you ‘down’. Take turns. If one of you feels about to come apart, take a step back and let the other parent take over. And most importantly, once you walk through that door, you will only think ‘my son is going to get better’, ‘he will get better’”. And somehow, that is how Robin and Dani have been handling the situation for the past two years. Alejandro began aggressive frontline treatment on October 5, 2009 following the European SIOPEN Spanish protocol. This consisted in 8 rounds of intensive Chemo, surgery to remove primary tumor, 12 sessions of radiation, autologous bone marrow transplant and six rounds of Accutane, which he breezed through with hardly a complication. As much as we wanted them to come here for treatment, they were confident and had faith in their doctors and hospital. In addition, Robin has lived and worked in Spain for the past 20 years and her husband and children are Spanish citizens. She and her family are covered under the Spanish Health Care System and carry no US insurance. By the fall of 2010, Alejandro was doing fantastic! His tests were looking good and he was declared NED (no evidence of disease). He was the crazy Ale that we all know and love (I'm hoping that they let me post the 'Wolverine' video and you will know what I mean!). Robin and I were even starting to talk about a visit here as they had promised as soon as the doctor's said ok; they would go to see Grandmom and Auntie Debbie, Uncle Jim and cousins, Poppy and Nanny too. Unfortunately, Alejandro relapsed in February of 2011. After only a few months of enjoying NED status and only 3 weeks of pre-school a small, isolated lesion was found near his sacrum. Surgery quickly followed, Neuroblastoma was confirmed and highly aggressive second-line treatment immediately began. To date he has endured 6 rounds of chemo, the first 4 so aggressive that for each round received, he was admitted to the hospital for a week to recover from low counts and to receive nutrition by TPN, and 14 rounds of radiation therapy. They are now awaiting scans- MRI and MIBG between the 9th and 14th of this month along with other testing. The last two sets of scans showed no reaction to the chemo, but no tumor growth or metastasis either. We are all hoping to see some kind of improvement on these next scans. If not, treatment strategy will have to be changed and this could take them out of country. The reason for this being that currently, there is no known cure for Neuroblastoma relapse. Nor is there any specific treatment protocol. There is, however, much investigation taking place and many different treatment regimes and clinical trials that can sometimes curb the relapse and put these children back into NED status or at least "stable disease". Unfortunately, most of these treatments and clinical trials are in the United States and other parts of Europe and not currently available in Spain. However, Robin and Dani are prepared to do what it takes to make sure that all the treatment options that could help their son reach NED status remain available to him.